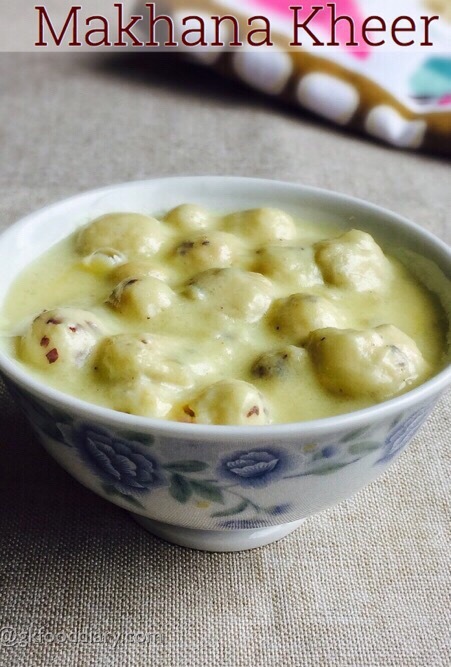 Phool Makhana Kheer – delicious and healthy pudding/kheer made with phool makhana aka puffed lotus seeds/fox nut, milk and nuts. This is one delicious, super creamy and thick kheer made with ground makhana powder. Its generally consumed during fasting and winter season in India. Makhana kheer is a best solution for sudden sweet cravings in kids as it can be prepared quickly. 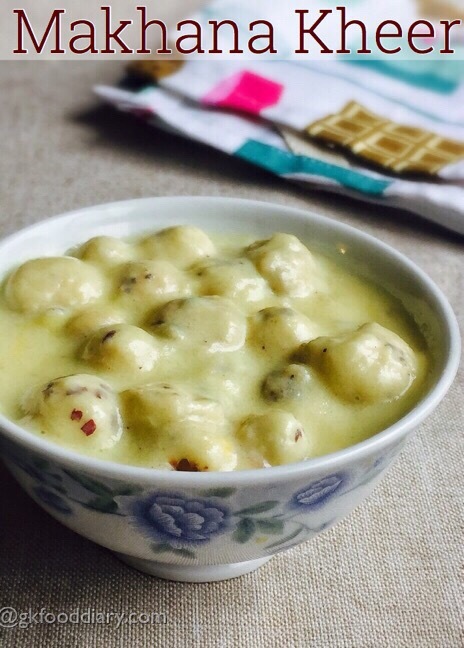 The protein and iron rich phool makhana kheer can be given to babies from one year as a quick dessert. Check more information on health benefits of phool makhana, when and how to introduce the same to babies here. 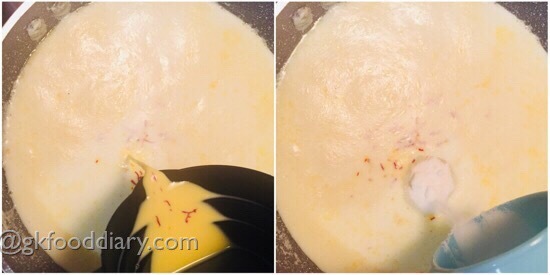 Here is how to make tasty phool makhana kheer recipe for toddlers and kids. 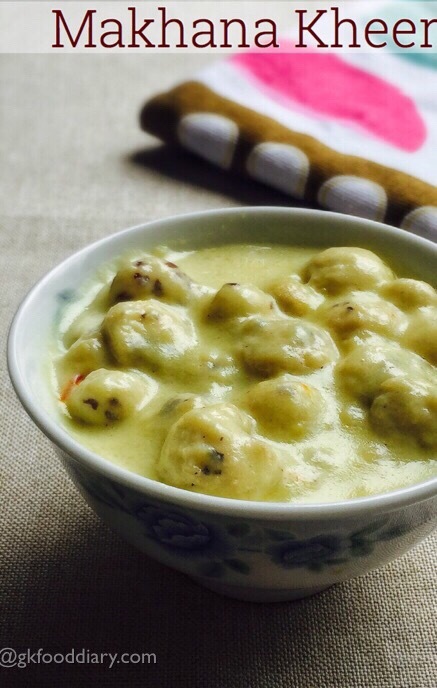 Phool makhana Kheer - Healthy kheer or pudding recipe with phool makhana aka puffed lotus seeds, milk and nuts. Nutrient rich kheer for babies and kids. Measure phool makhana and cashews. Keep all other ingredients ready. Take and Cut the phool makhana into two, check for warms if any. Cut and check for all the makhana’s. Then dry roast the makhanas in a heavy bottomed pan until it turns crispy. Take one roasted makhana, eat one & check whether its crispy and not chewy. Once the makhana is roasted well, remove it form the pan and switch off the flame. In the same pan, add cashews and roast it for 30 seconds. Remove from the pan and cool it down. 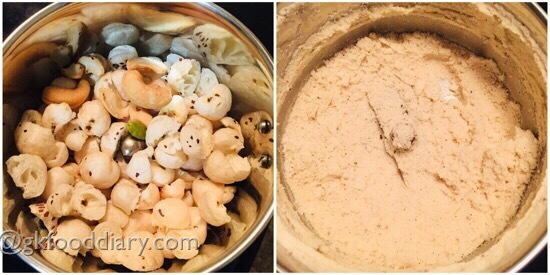 Transfer 1 cup of roasted phool makhana, roasted cashews and cardamom to a blender/mixer/food processor. Grind them to a smooth powder. Cool it down and set aside. Reserve 1 cup of roasted phool makhana to add in the kheer at the final stage. 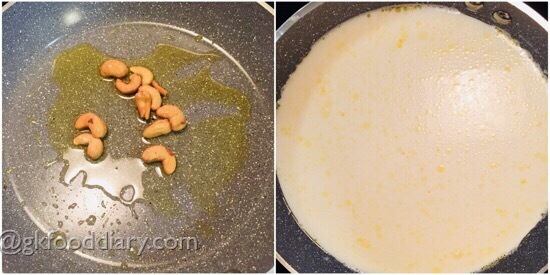 Take a thick bottomed pan and add a tsp of ghee, roast the cashews for a minute. Remove from the pan once done and set aside. Pour milk in the same vessel and boil it in low medium flame. In the mean time soak saffron in 2 tbsp of milk and keep it ready. After 7-10 minutes boiled milk must be reduced in quantity and becomes thick. At this stage. add saffron milk and followed by sugar. Mix well and cook everything in a low flame for 5 minutes. Then add powdered phool makhana mix little by little and give a stir quickly. Make sure there are no lumps formed. Boil everything until the kheer becomes thick. Stir it occasionally otherwise it gets stick to the bottom. 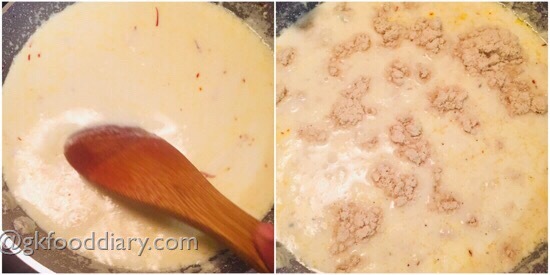 Once the kheer is thick, add the reserved 1 cup of roasted phool makhana and mix well. Cook it further for 3 minutes. Finally, add ghee roasted nuts. Once done, switch off the flame. 1. Measure phool makhana and cashews. Keep all other ingredients ready. Take and Cut the phool makhana into two, check for warms if any. 2. Cut and check for all the makhana’s. Then dry roast the makhanas in a heavy bottomed pan until it turns crispy. 3. Take one roasted makhana, eat one & check whether its crispy and not chewy. Once the makhana is roasted well, remove it form the pan and switch off the flame. In the same pan, add cashews and roast it for 30 seconds. Remove from the pan and cool it down. 4. Transfer 1 cup of roasted phool makhana, roasted cashews and cardamom to a blender/mixer/food processor. Grind them to a smooth powder. Cool it down and set aside. Reserve 1 cup of roasted phool makhana to add in the kheer at the final stage. 1. 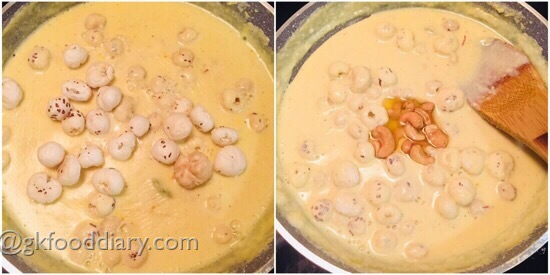 Take a thick bottomed pan and add a tsp of ghee, roast the cashews for a minute. Remove from the pan once done and set aside. Pour milk in the same vessel and boil it in low medium flame. 2. In the mean time soak saffron in 2 tbsp of milk and keep it ready. After 7-10 minutes boiled milk must be reduced to in quantity and becomes thick. 3. At this stage. add saffron milk and followed by sugar. 4. Mix well and cook everything in a low flame for 5 minutes. Then add powdered phool makhana mix little by little and give a stir quickly. Make sure there are no lumps formed. Boil everything until the kheer becomes thick. Stir it occasionally otherwise it gets stick to the bottom. 5. Once the kheer is thick, add the reserved 1 cup of roasted phool makhana and mix well. Cook it further for 3 minutes. Finally, add ghee roasted nuts. Once done, switch off the flame. 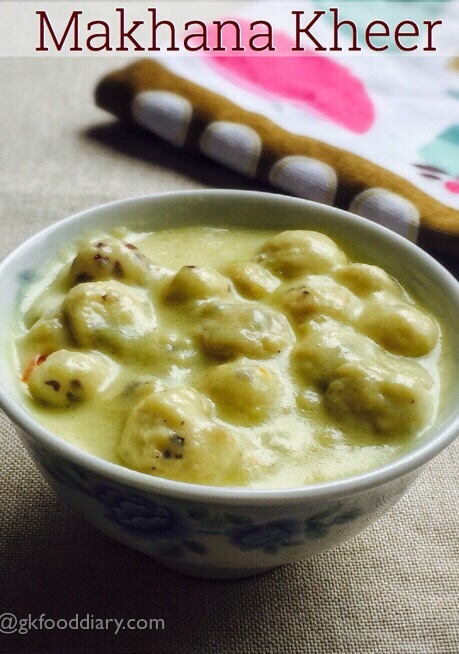 Healthy and phool makhana kheer is ready! 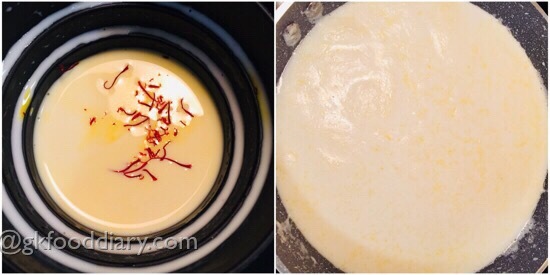 The makhana kheer becomes thick after cooling down, add warm milk to adjust the consistency while serving. You can also ground 2 cups of roasted phool makhana if your child doesn’t prefer to eta whole makhana. You can also add raisins and any nuts of your choice to this kheer. Avoid whole nuts for small kids and use nuts powder instead.